How much do students really pay for college? As my last post indicated, average college tuition prices can be quite misleading because of the considerable variation across and within states, even within the public sector of higher education. But there is much more to the story. Most students receive financial aid that reduces the prices they actually pay. The federal government provides Pell Grants to low- and moderate-income students—now including over a third of all undergraduates—as well as tax credits for parents and students who pay tuition—now about $17 billion a year and extending up the income scale as high as $180,000. State governments also provide grant aid that does not have to be repaid. Like published prices, grant aid varies dramatically across the country. Some states provide aid only to students with financial need. Others ignore the students’ financial circumstances and look only at their high school GPAs or at standardized test scores. In 2011-12, state grant aid per undergraduate student ranged from under $200 in 12 states to over $1,000 in 10 states. Colleges and universities across the country provide about as much grant aid to students as the federal government does. Community colleges and for-profit institutions don’t do much of this form of discounting, but it has become more common at four-year publics, and is most significant in the private nonprofit sector. About half of the grant aid at public four-year colleges goes to meet financial need, with the rest designed to attract students otherwise likely to enroll elsewhere. 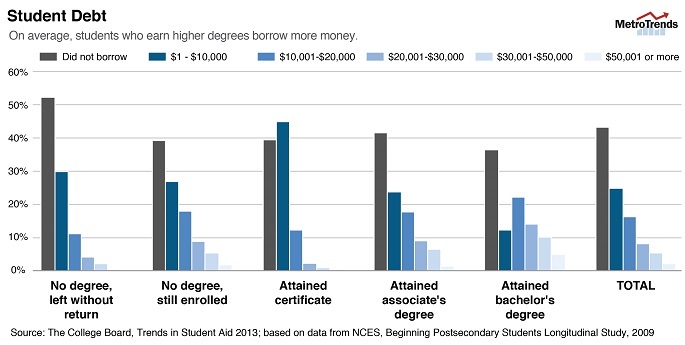 At private colleges, just over 70 percent of the grant aid goes to meet need. To understand how people pay for college, we must integrate information about all of this student aid with information about sticker prices. Full-time students at public four-year colleges and universities receive an average of about $5,800 a year in grant aid from all sources and federal tax benefits. That means that the average price tag of about $8,900 for public four-year colleges and universities in 2013-14 amounts to a net price of about $3,100. The net prices are much less startling than the published prices. But this year’s $3,100 compares with about $1,900 (in 2013 dollars) a decade ago. Moreover, students have to cover their living costs while they are in school. And perhaps most significant, only the incomes of those at the top of the income distribution have begun to grow since the recent economic collapse. We will be better able to address the critical problems of college access and affordability if we focus on the realities instead of exaggerating the prices and the student debt issues, and if students have better access to information about the true price of higher education. Borrowing money through student loans is the only option for many students to obtain a degree at a educational institution.